Fury Custom Boats launch just a handful of boats each year, and company principal Scott Fury is all over every molecule of them. Every Fury, although using the same hull moulds, is subtly or significantly different. The review 282 DC (DC for dual console) represents the current peak in evolution. In a smaller vessel the style might be called bow rider, but here the layout is something far grander. The heart of the vessel resides under the hardtop where the dual consoles live. They are separated from the bow cockpit by glass above each of them and a central door with a lift up windscreen above it. Within and below the port console is a space for a single bed and/or storage space; the starboard compartment houses a toilet with overside discharge. 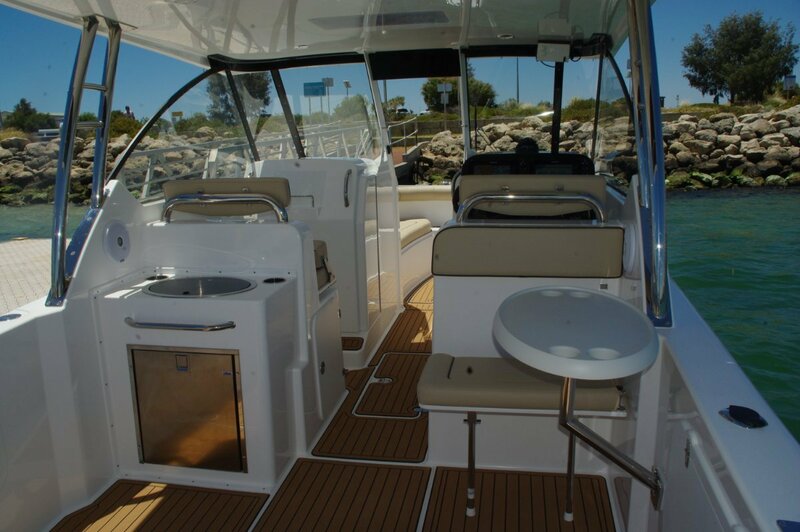 The bow cockpit provides luxury sprawling for a couple of adults – the stereo has a remote to save them moving - with more storage under the settees and also under the deck. 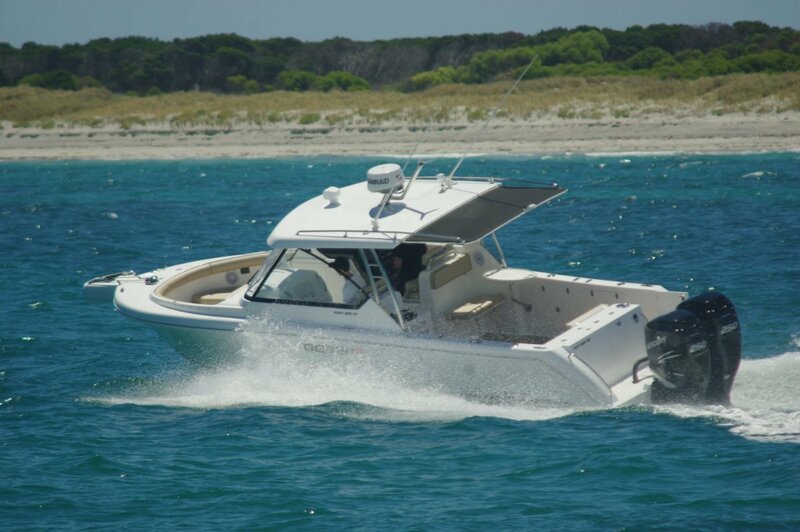 Fury provides covers for both cockpits for when the boat is in storage, but camping covers are available that – together with an infill – convert the space into a double bedroom. Weekending is more than possible, with abundant room in the main cockpit for air beds. This is the highest powered Fury so far: 500hp provided by a pair of Mercuries. The long-proven hull is well able to make use of this, topping out at 50 knots on a day that was far from flat. That is a lot of speed on any day, but that much power also allows cruising in the mid 20s with a very small throttle opening – very low wear rate on the motors. 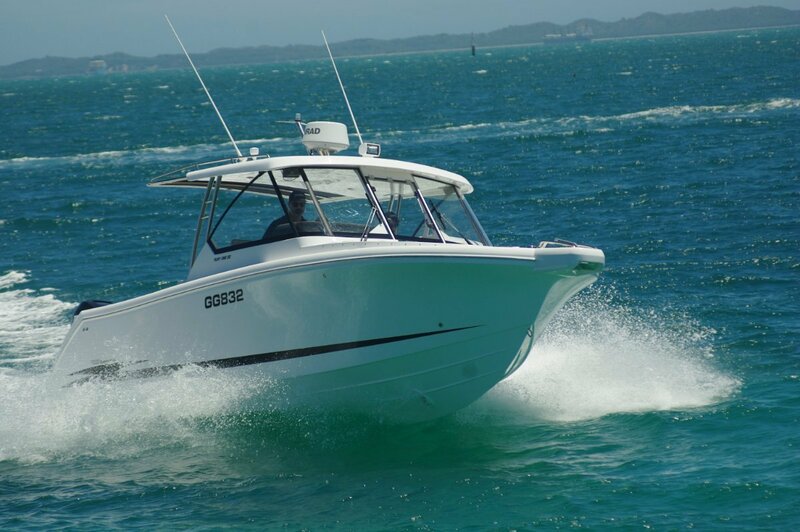 The 282 has a large, fishable cockpit that converts to day cruiser mode in moments. A double seat folds down from the transom, another from the rear of the skipper’s seat, and a table plucked from one of the innumerable storage spots clips into place in front of it. Alternatively, the table can be fitted in the bow cockpit. The vessel is well equipped to service the seated passengers. At the rear of the navigator’s seat is a sink with a fridge below it. The fridge has drawers rather than shelves and even has a wine rack. Cooking is taken care of by a drop-in barbecue at the transom. Stoves are fast becoming an unwanted sea going item. As in many other current boats, Fury has chosen C-Dek cladding for the deck. Kind to feet as well as being hard wearing, it is also very good looking. Individually made to measure for the boat, this example has the look of a timber deck- but not the absorbent to red wine property. Stripping the cockpit for fishing action is easy because Fury has provided so many stowage options. One is locally unique: along both sides, within the thickness of the bulwarks, are rows of lockers. These are the obvious places for berthing lines and fenders that normally just lie around. Fishing equipment includes a pot winch and containers for the catch. There is a pair of 120 litre kill tanks plus a 100 litre circulating tank – the latter ideal for crays, and proven to keep them alive for more than a day. It is unusual for a boat to provide seating for four people facing ahead at the windscreen, but that is what the 282 does and in considerable comfort. At the consoles is a pair of double bolster seats, the driver’s side facing a mouth watering dash. 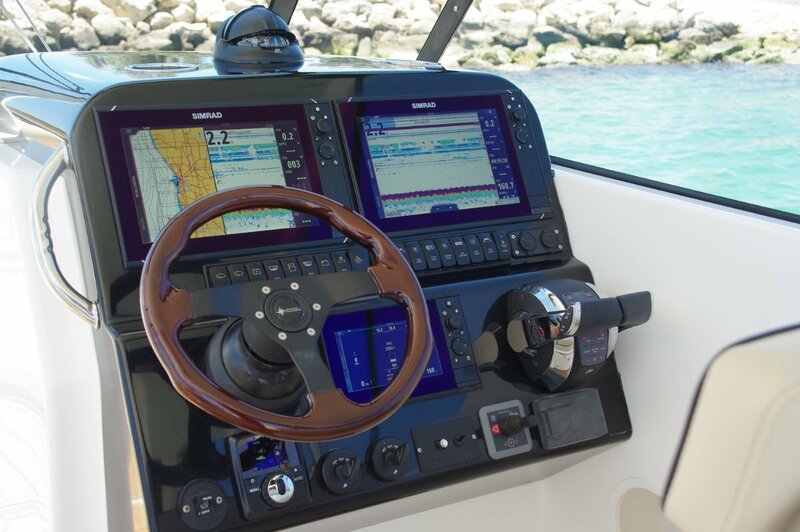 Two Simrad screens for the plotter, sounder and 4G radar, the latest Mercury digital information system, a serious compass, an adjustable wheel and a lot of switches and minor controls. Among many other functions they control the power windlass, the remote control spotlight and the 2.2hp bow thrusters. A tiny feature epitomises Fury’s attention to detail. In the hardtop is a small frosted glass panel. When the masthead light is switched on it delivers enough stray light to faintly light up the glass and deliver useful background light. If it does not it is telling you the masthead light has failed.